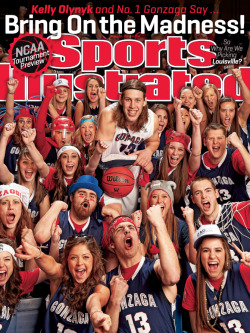 It’s a good week to be a Zag: Last night, the Spokane City Council issued an official proclamation that this is “Gonzaga Basketball Week,” and star player Kelly Olynyk is gracing the cover of Sports Illustrated with a pack of fans this week. But wait, isn’t that a bad thing? But then it goes on to catalog dozens of “notable incidences” of the jinx, including Gonzaga player Matt Bouldin’s cover appearance in 2010, so you decide. Sports Illustrated did a cover story about the cover jinx back in 2002, complete with a photo of a black cat, but didn’t find any evidence that bad things always happen. Snopes has investigated the similar Campbell’s Chunky Soup curse and Madden NFL video game curse, and found no causation in the superstition. There is, however, a chilling truth beneath the superstition: Teams and players get featured when they’re at the top. And, typically, what goes up must come down. But hopefully it will be a long while before we have to think about that. Happy Gonzaga Basketball Week!